Marked out court with Hugh. Had tennis in afternoon with Leslie & Joan Kid & Jack. Lovely. Played slapdown after supper. That is the very last entry Enid made in her 1924 diary. Such a shame, what with her on the point of getting married! So we are thrown all the more onto what the Teachers World columns reveal. And the work log. Diary blank. Work log records that Enid wrote two Talks. However, the right hand pages of the same log reveal that on this day she sold three Talks to Teachers World. As we'll see, not only did the excitement (or stress) of getting married coincide with Enid neglecting to write up her diary, she obviously only wrote up the log book intermittently and there are a few inconsistencies and omissions which I'll point out while trying to establish what happened in Enid's life in this important month. Of the three Talks, I think she wrote this one first, because it's the first on the list for work sold on August 10. I wonder who was in the plane writing ‘Daily Mail’ across the sky. Perhaps it was Hugh Pollock’s way of pitching another article to that paper’s editor. I wonder also if anything more came of Hugh’s ambitions in that direction, over and above ‘WHEN THE SCOT COMES SOUTH’. Was he not busy enough as books editor for Newnes? Did he really have time to be a journalist as well? ‘WHEN THE SCOT TAKES TO THE AIR’ by Hugh Pollock. Should I be scouring copies of the Daily Mail for August 1924 for such an article? ‘Pairs-of-Eyes’ is one of Enid's more abstract pieces. It could have been called 'On Looking', to fit in with the titling of 'On Surprises', On Conversation', On Asking Questions' and 'On Pretending'. 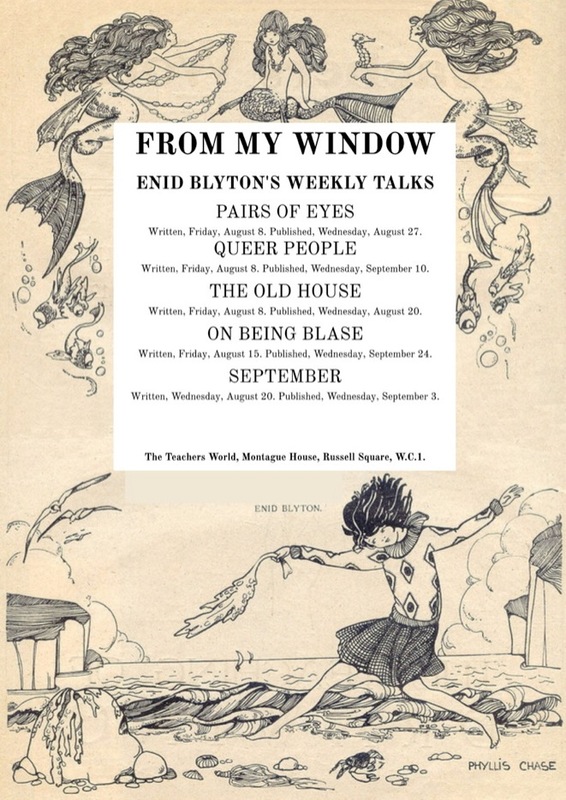 In many other Talks, Enid has been first and foremost a ‘pair-of-eyes’. Starting with ‘Hoar-frost’, when she carefully looked at the impact of frost on the back garden, and meticulously dsecribed what happened when the sun came on the scene. But rarely if ever does she remain a pair-of-eyes from beginning to end of a piece. ‘Blue Magic’ begins with some general scene setting. Then there is a long paragraph taking in the actual sight of bluebells in Bracken Wood. But before this is finished, she’s speculating about the significance of the sight. Who does the glorious thing belong to? Not her, she suggests, but someone altogether more innocent, a child or an elf. Similarly, in ‘Summer Gold’, for much of the piece she is looking, looking, looking at a field of yellow buttercups interspersed with daisies. But eventually her imagination goes to work, she imagines the burnished petals of the buttercups being collected by fairies. And if the flowers don’t give of their precious load voluntarily, then they’ll be given a good shaking, because the fairies must fill their sacks! Enid makes a splendid pair-of-eyes. But all her looking invariably feeds the third eye of the imagination. This is the second talk where Enid has labeled herself anti-social, in that she doesn’t like everyday conversation. The other was ‘On Conversation’ where she tried to instigate a talk about politics but soon opted out of the resulting exchange of views, or should I removed herself from hearing distance of the male monologue. I think what she was saying in that earlier Talk, and what she’s saying here, is that she doesn’t have a herd mentality, and so is not trying to work her way towards the general consensus on any subject. Nor does she want to be a leader, having carefully thought about what everyone else is talking about and having a particularly sophisticated opinion. Instead, she has faith in her own imagination. Developing her own authentic vision was what gave her intellectual pleasure. In ‘Wild Strawberries’, instead of going for a picnic with the adults, Enid takes Pamela to Rabbit Corner where they enjoy a micro-picnic and speculate about the appetite of Greyears. Not something that would have been on the agenda of the adults, or the ‘grown-ups’ as Enid insists on calling them. Enid was indeed a bit queer herself. More than a bit queer. She kept caterpillars in boxes, for goodness sake! She stood in the middle of nature - in all weathers, in all seasons - and just looked until her imagination clicked into gear. And if she wasn't just looking then she was just listening for the call of the cuckoo, the words Cuckoo Wood and Cuckoo Lane going round and round her head, until - Bingo! - a vision of the world, but not as we know it. She was not bothered about black cats, or sparrows, or peppering strawberries, because there was so much more to being queer than such trivial deviations from the norm. 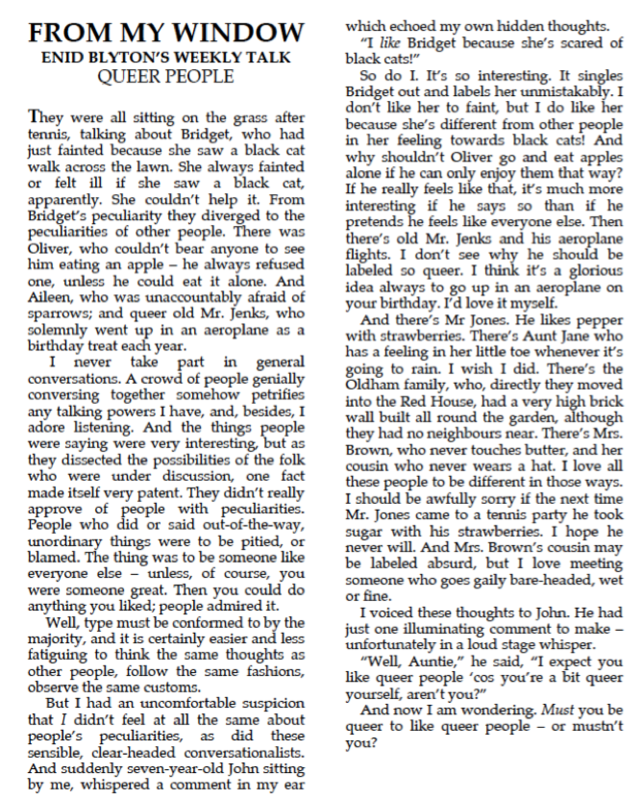 No disrespect to Bridget, Aileen or Mr. Jones. And certainly no disrespect to Mr. Jenks, who went up in an aeroplane every year on his birthday. I’m now thinking it might have been him and not Hugh that Enid saw writing Daily Mail in the sky. That is queer! 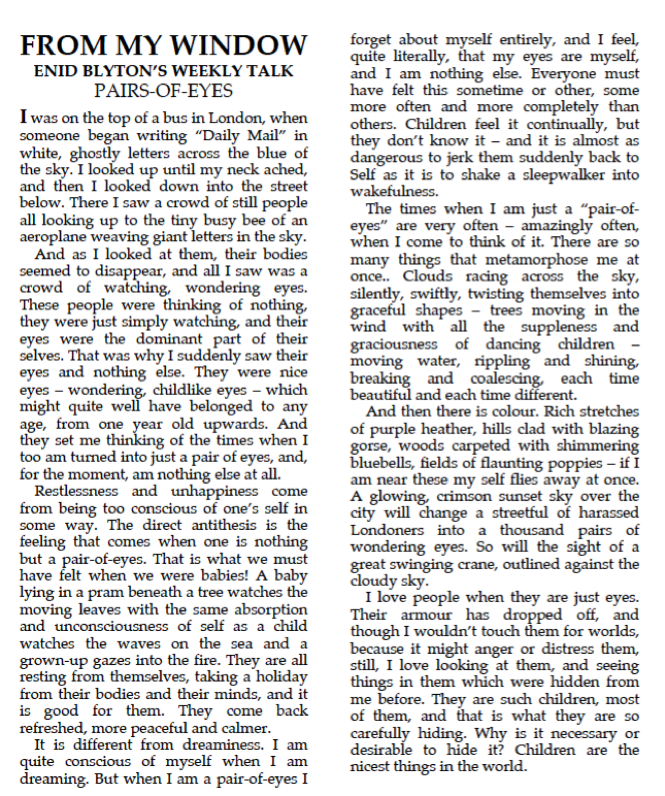 Let’s take our time exploring the layers of this sublime essay. It’s possible to think of it as the third in a trilogy of pieces. Beginning with ‘May Nights’, where Enid is sitting on her window-sill at midnight, the wood a thing of owl-haunted mystery. 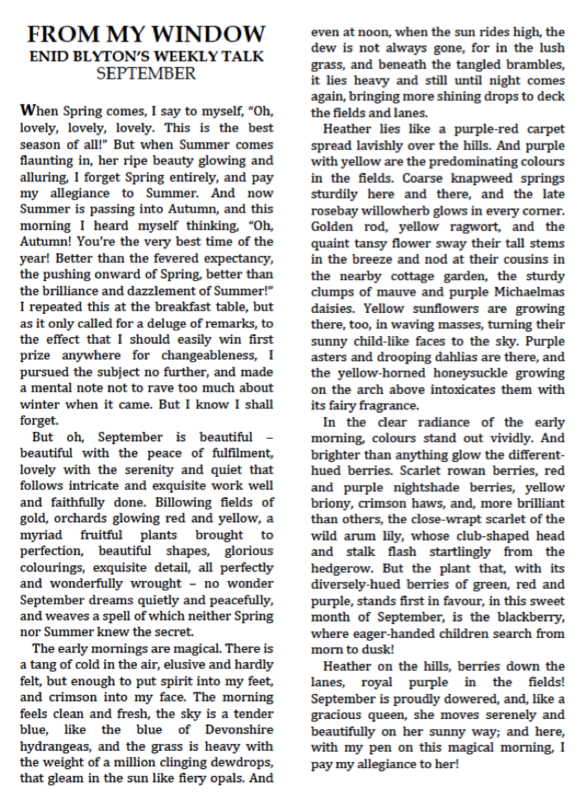 Continuing with ‘A Wakeful Night’, written in June, with Enid, in the early hours of the morning, again at her window, obsessing about who is walking along the road between her house and the wood. And culminating here, with Enid walking in the wood in the middle of the day. How does that accord with Enid’s experience of the cuckoo in 1924? She heard her first cuckoo while on holiday on the South Downs. She heard them calling from Cuckoo Wood, from dawn till dusk. She got a reply to her own “Cuck-oo!” from Cuckoo Wood, starting off the dawn chorus. Cuckoos were not mentioned, either in Beckenham or on holiday again in Sussex. All quiet on the cuckoo front. Enid didn't climb up to the top of the ‘old house’ in 1924, but many years earlier, when she already knew the site well. I think the once-only exploration – climbing the perimeter wall, walking along a narrow passageway, coming across an inner yard, spotting the tower, clearing ivy from the doorway, opening the door, climbing the stairs, mounting a ladder, then finally emerging onto the top of the tower – must have been a significant experience for Enid Blyton. The Famous Five series would have been a lesser thing without this kind of formative experience! 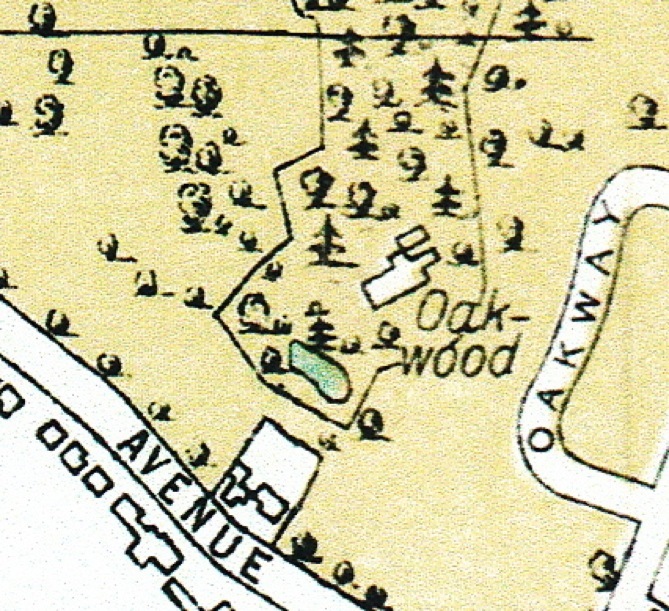 We can see from the following map of Oak Wood (Cuckoo Wood) that there was indeed a house in the middle of the wood. (The map is from 1930, the house was demolished in 1936.) The building that shows stark white against the delicate green of the wood. 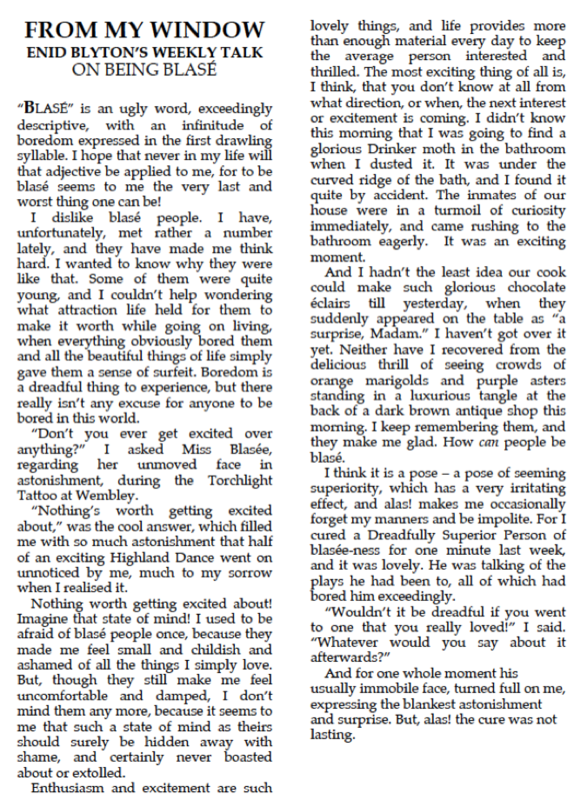 David Chambers talks about the house in an article I've already mentioned from Enid Blyton Society Journal 50. He provides an old postcard-photo of it, complete with tower and ivy. The house was called Oakwood House, which is the same name as the place Hugh was staying on Oakwood Avenue that summer. Not the same actual place, surely, as Enid describes the ‘old house’ as being in a state of renovation, being turned into a hotel. Though the hotel couldn't have done very well as the building was demolished just twelve years later. I think we can assume that Enid was wandering in Oak Wood (towards the right edge, near the foot of the map below), in the month of her impending marriage, thinking about the massive change that was about to happen in her life. If she had been able to climb up the tower of old Oakwood House and had look west, she would have been looking towards Clockhouse Road. 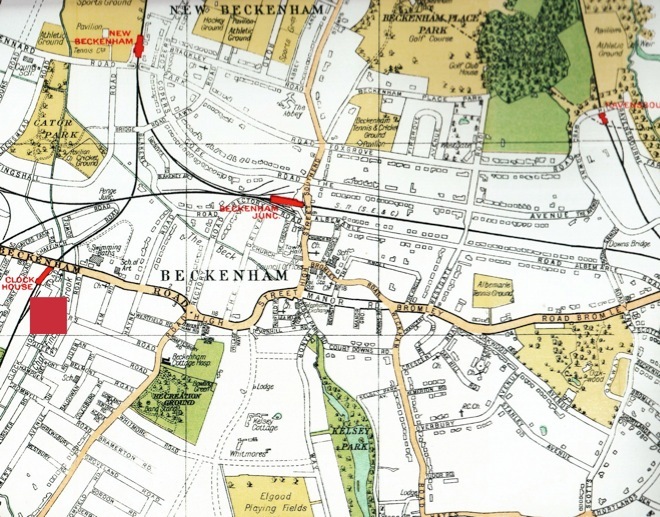 It was while living in numbers 31 and 35 Clockhouse Road (marked as a red square near the left edge of the map) that Enid had explored the lanes, woods and hills of Beckenham with her father, from the age of six to nearly 13, when Thomas left his wife and family. Enid was 26 in the summer that she was engaged to Hugh. By then she'd lived half her life with - and half without - her father: the naturalist, the walker, the reader the teacher. How sad for Enid, to think about this. Though there would have been the hope that Hugh was going to be as inspirational a thing in her life as her father had been. Can you hear them Enid? The old house, the old wood, the old view, all singing softly in your ears. Singing of their ongoing, nurturing love for an unspoilt creature and their high hopes for it. That creature being you. Diary blank. While the work log tells us that Enid wrote the first half of a play called 'King Cole Calling', the second half being written the next day . I've already mentioned this at the start of May, when Enid wrote a synopsis of the work. With Hugh off to work, Enid would have got on with finishing King Cole Calling! After doing so , Enid wrote another Talk. Yes, Enid is a full-blooded, enthusiastic person. As she says, ordinary life provides more than enough material every day to keep the average person interested and thrilled. A drinker moth licking the cream from a chocolate éclair, perhaps. Enid states that the best thing is that you don’t know from which direction the next interest or excitement is coming. How about that you’re getting married to Hugh in less than two weeks time. Can you not see that coming? Isn’t it exciting? 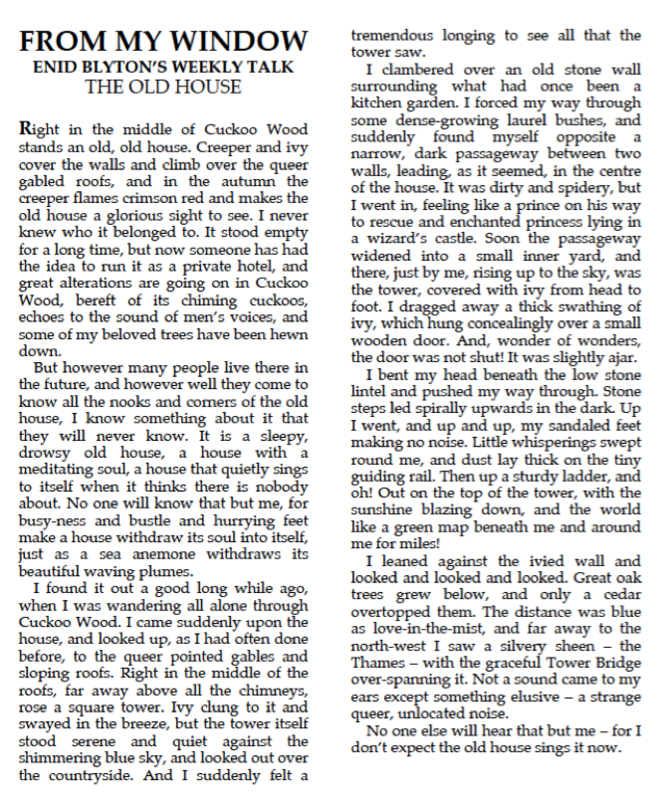 On this day, it's ‘The Old House’ that actually appears in Teachers World. However, with her wedding coming up in the last week of August, Enid got another one banked. That's according to her work log, anyway. Actually, according to her log, she wrote both 'September Mornings' and 'Bimbo', marking each as a 'talk'. However, no such title as 'Bimbo' appears in the pages of Teachers World. Besides, Enid notes that it is an 800-word piece, and the Talks are invariably between 600 and 650 words and marked as such. The mix-up being another sign of the excitement and distraction she is feeling in the days immediately before her marriage. Blasé Blyton? I don’t think so. Enid Mary Pollock. Imagine that! Oh, but Enid needs to calm down. And what better way than to lose herself in thoughts of nature and the passing of the seasons? What better way to take her mind off August 28th than to think past that to September? Who could it be that was so grumpy at the breakfast table? Well, since Hugh moved to Oakwood Avenue, he and Enid had been breakfasting together, so surely it was he. Let me again quote the start of A Midsummer Night's Dream. When I say it was Enid's favourite play, I base that on the two Talks she would give on it in the next few months. After all, the play is awash with young lovers, fools and fairies. Bottom and Puck will live forever, just as Goon and Fatty will. Four days will quickly steep themselves in night. 'Pair-Of-Eyes' gets published. This leaves 'September', 'On Being Blasé' and 'Queer People' left in the bank so that Enid can go on honeymoon with her Hugh. I'm going to speculate that there was a pre-wedding meeting between Phyllis Chase and End Blyton on this day. Enid may have wanted to explain why she wasn't inviting Phil to the wedding. No-one was being invited! Not Hugh's family and friends, not her own. Just Mabel Attenborough and her parents to act as witnesses. 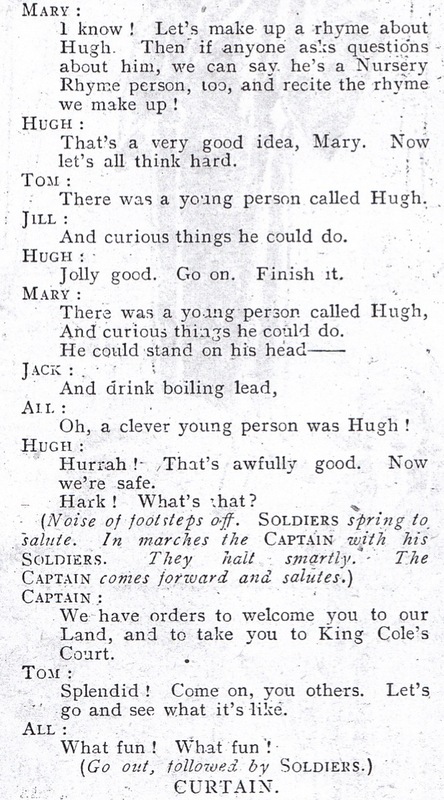 Clearly, Phil would have been encouraged to read the limerick about Hugh. Phil: "That's hilarious. But let me see if I can come up with a variation." While directing your way to the zoo." Enid: "Not bad. How about this:"
Oh, a lucky young bridegroom was Hugh." Phil: "No, no, I've got it." Oh, a funny old codger was Hugh." Phil: "I'm so sorry! Not getting asked to the wedding seems to have knocked my sensibilities for six. But I'll get over it. And I wish you long life and life-long happiness!" Enid and Hugh got hitched. 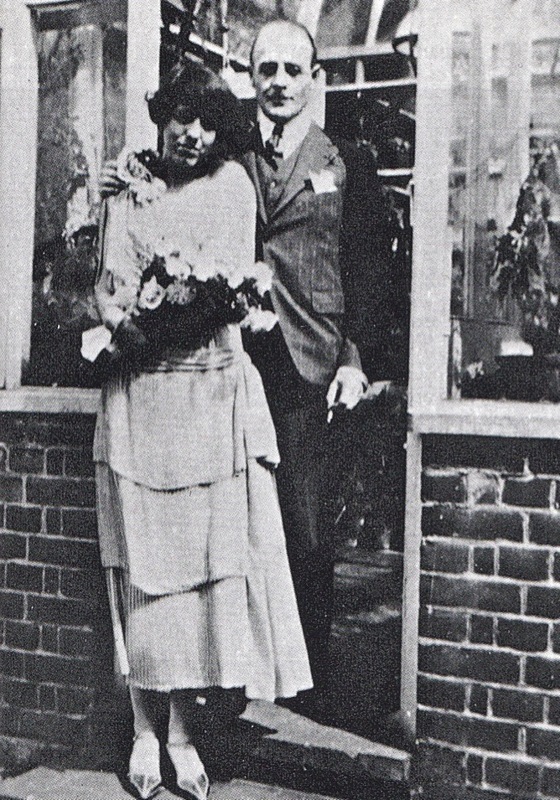 The photo below was taken at the Attenboroughs' house in Beckenham. In the background may be the verandah that is mentioned in Enid's diary in the summer of 1924. (Or is it a greenhouse? Or a conservatory?) In the foreground stand 'love's young dream'. She is holding flowers, to symbolise her love of nature. He is holding a fag, representing just one of his addictions. Can Enid still hear the cuckoos calling from Cuckoo Wood? Surely, she can! That phenomenal wife of poor Hugh." Whose wife wrote for me and for you. That Shakespearean wife of poor Hugh." Enid is on her honeymoon. Why would she bother with diaries and work logs? Have a good one, Enid. I hope you've room in your bags for Phyllis's lovely wedding present. A poster for the new flat in Chelsea. What a fabulous farewell to the single life!